Kids Chess Club is a non-profit Company founded by International Chess Master Larry Evans and Tom Callaghan as a way to provide more chess classes to more kids. All tax deductible registration fees and donations will help pay for Chess Clubs at your school and at other less privileged schools. It is our mission to broaden the horizons of young minds through chess and offer free chess clubs to disadvantaged and under-performing students at underprivileged schools who otherwise could not afford it. Our goal is to teach children in grades K-12 abstract concepts of planning, analysis and strategy through the game of chess. Kids will be excited to understand and amazed by the positive experience that chess offers. We believe that when a child learns the most complicated game in the world they will build self-confidence, develop self-learning tools and learn how to evaluate their own decision making process. This after-school Chess Club for Kids is fun and educational. Kids in the Chess Club participate in mental gymnastics, learn chess from trained instructors, and experience competition with others. Kids who learn chess will sharpen their analytical and observation skills which will be very useful in many aspects of their life. The Chess Club offers a safe, nurturing environment for kids to learn abstract concepts and compete with each other in a mental game. 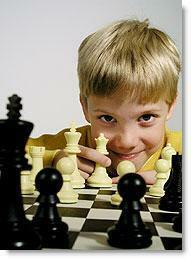 Chess teaches critical & abstract thinking, planning, logic and analysis. It improves the ability to concentrate and teaches the value of good sportsmanship. Chess also teaches the importance of behavior management: making good choices and considering all possibilities. International Chess Master Larry Evans of Mountain Lake Chess Camp is famed for his Chess Schools for kids in San Diego, San Francisco, Lake Arrowhead and Hong Kong; and our combined teaching experience amounts to over 25 years in schools and other venues across San Diego County. Dubbed the “Evans Method” by the United States Chess Federation (and once featured on the Tonight Show), this uniquely interactive teaching style has transformed thousands of children and youth and produced national chess champions at every scholastic level. After School Sessions are 8 weeks, meeting once per week for 1 hour and are open to all age groups from grades K through 12. Each week students will win prizes for their active participation and attention. At the end of 8 weeks Trophies will be awarded to the top players and all other players will receive a participation award. Tournament competition will also be available for an opportunity to win additional trophies. 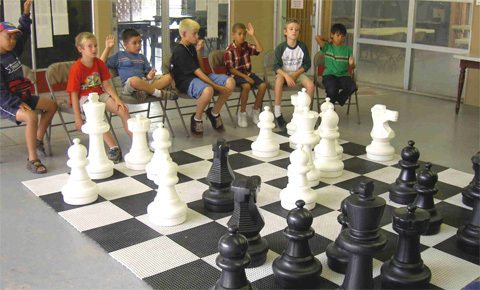 Kids Chess Club makes the game of chess easy to understand and fun for all ages. Please check this web site periodically in the future for more information on our non-profit activities and upcoming events.